Santa Fe Recycled Art Festical Kicks Off Today! The Santa Fe Recycled Art Festival is one of the biggest Recycled Art Events in the region. UpCycle SF brings innovation in plastic waste to New Mexico and the world. The fourth National Climate Assessment was released last week and it contains critical information about the current state of the climate and its future. For the fourth time in five years, Keep Las Cruces Beautiful (KLCB) has its outstanding work recognized. NASA is including a plastic filament 3D printer and recycler to the International Space Station. Thanksgiving is all about food. But did you know that 40 percent of all food in the United States goes to waste every year? Atomic City Transit was awarded a grant to purchase two electric busses. Deming&apos;s Recycled Art Show kicked off last week, and featured incredible pieces made by local artists. KNMT Has a Girl Scout Patch! 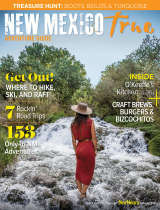 Keep New Mexico True has an official Girl Scouts patch!